Whole Wheat Cereal with Crispy Pieces and Added Vitamins and Iron. 24 Biscuits. Made with wheat protein. High in fibre. Iron & vitamins. Suitable for vegetarians.Power your body! 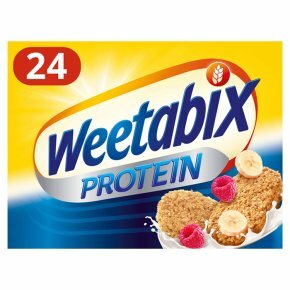 Weetabix Protein is packed with wholegrain and high protein wheat crispies for healthy muscles and strong bones*. Top them with a handful of berries for a tasty breakfast to power you through the morning! *Protein contributes to the maintenance of muscle mass and normal bones as part of a ,healthy diet and lifestyle. Have you had yours?